I wrote too hastily in my last post. I said that I had run the Milan marathon at the end of one of the more stressful weeks of my life. I had not foreseen the subsequent week. Nor the week after that. And don't ask me about Christmas. On the night of the Milan marathon, and in the three weeks that followed it, my life fell apart. Or some major part of it. 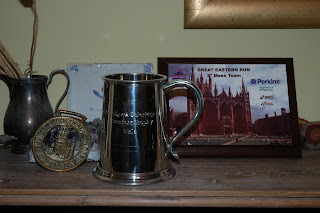 I was going to write a post about winning the Cambridge and Coleridge Athletics Club marathon trophy for my Berlin performance. You can see it sitting on my mantlepiece in the accompanying photograph. It's next to the horse brass for a stage in the Hereward Relay (a crazy and wonderful off-road four-stage relay from Peterborough to Ely in late November. I ran it with a cold). You can also see there a very attractive plaque - for third (male) team in the Great Eastern Run (the Peterborough half marathon). I've never won any silverware before, ever, so the cup is quite pleasing. When I start running again, it will probably motivate me. Wine Odyssey (no, I insist, go and look at it). But nor am I going to write a post about my life falling apart. Instead I am going to reflect on a comment a friend sent me in an email -- and it's been good to have such committed friends who are rallying round and offering recuperation and hope. As I look to a new future, one that had been entirely uncontemplated on 1 December, I think of these words: "Don't let it get in the way of the blog." It has got in the way of the blog, obviously, and I apologise for the silence. I will now return to form, though as a slower runner, and will be more diligent in writing the blog. The blog has a life of its own, and is the space where narrative clashes with judgement, perspective and morality. Reader, please don't give up on it.